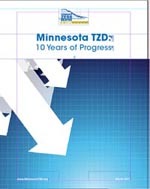 The Minnesota Toward Zero Deaths program has published Minnesota TZD: 10 Years of Progress (PDF), a 12-page report highlighting the program’s successes in the decade since it began. Before 2001, efforts to improve traffic safety were mostly carried out by individual state agencies. In response to an increasing trend in the number of traffic-related fatalities and serious injuries in the state, the Minnesota Departments of Public Safety, Transportation, and Health in 2003 established the Toward Zero Deaths (TZD) program to integrate safety programs in Minnesota. Since then, traffic fatalities have decreased by 40.5 percent. This report describes some of these efforts in the areas of driver behavior, roadway environment, emergency response, and partner collaboration.